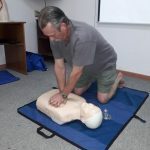 In early February 2018, retired Fire Commander, Ronald Ellerman conducted CPR Training for 84 of our staff members. 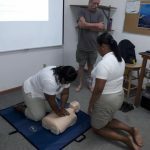 The CPR trainees included dive staff, bartenders, wait staff, front desk staff, housekeeping, dolphin trainers at RIMS, Maya Key staff, and managers. 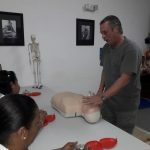 The course began by defining CPR as an acronym for Cardiopulmonary Resuscitation. A mechanical function to restore blood flow to the brain, heart, and other vital organs. 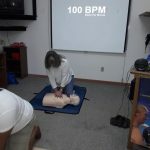 First, participants learned the difference between a “heart attack” and “cardiac arrest.” A heart attack means there is a problem with the heart, but it is still beating and pumping blood to the vital organs. Cardiac arrest means that the heart completely stops beating and blood does not circulate through the body. A person in cardiac arrest would also not be breathing. 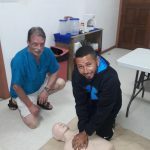 After the fundamentals, Ron went on the explain the importance of oxygenated blood flow. Pointing out that while many organs can survive with an interruption of oxygen, two organs cannot survive more than four to six minutes — the brain and the heart. In the event of cardiac arrest, the brain would almost immediately show severe signs of loss of blood flow. 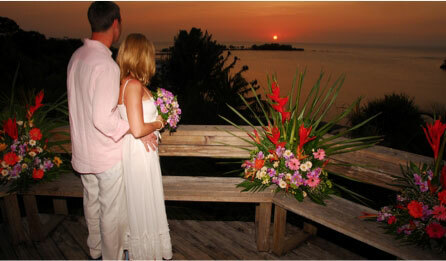 The heart would also show signs very quickly and begin pumping erratically with a lack of oxygen. 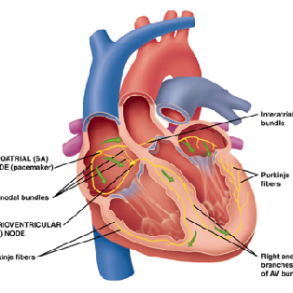 The heart is a four-chambered pump. The right side of the heart receives blood from the body and then pumps it to the lungs to get more oxygen. The blood is pumped from the lungs to the left side of the heart where it then pumps the freshly oxygenated blood throughout the body. This cycle occurs over and over throughout your entire life! 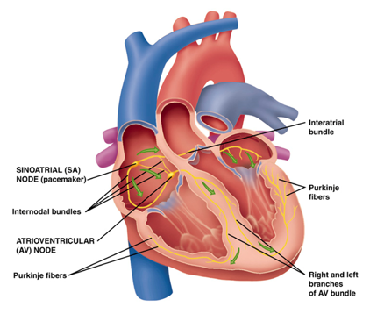 The heart also has an electrical system which causes it to contract to pump blood out and then to relax again to allow blood to refill the heart. 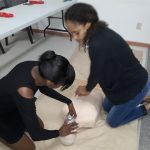 Participants in the course learned that by starting CPR immediately, even without breathing for the patient, they could extend the survivable time of a person in cardiac arrest by 12 to 15 minutes. Which may be enough time to call for more advanced trained personnel and equipment. How to recognize when someone is in trouble and in need of CPR? If the person looks unresponsive: Shake and Shout! If there is no response: Call for HELP! Next, look at the chest for “Rise and Fall” and listen for breathing. If not breathing and unresponsive: Begin CPR! 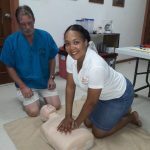 During CPR the chest is compressed to force blood out of the heart and back into circulation. Compressing the heart between the breastbone and the spine by placing hands on the chest, with the heel of the hand on the lower half of the breastbone and away from the lower tip of the sternum. 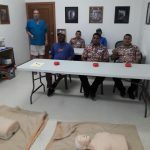 To perform compressions, participants learned to position themselves over the patient and close enough to align their shoulders over the person’s chest. Ron instructed them to keep their arms straight, elbows locked, and use their upper body weight to compress the chest. He emphasized that they should not take their hands off the chest, but allow the heart to refill while staying in position. Next, trainees learned to “breathe” for the patient and discovered how to deliver oxygen by giving a person a breath of air in their mouths. 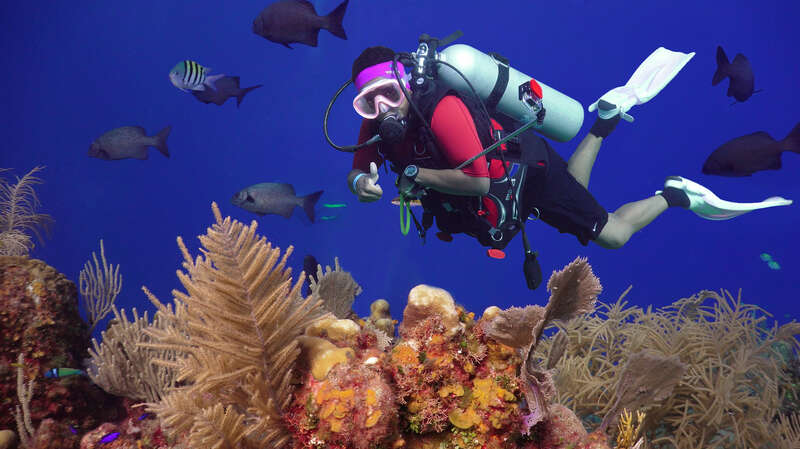 Whenever we breathe, we use only 5-6% of the 21% the oxygen inhaled, therefore the air we exhale contains 15-16% oxygen, making a quick and efficient way to get oxygen into a person in need. In giving “mouth-to-mouth,” participants learned how to use a “Pocket Mask;” a device that allows artificial ventilation without coming into direct contact with a patient. 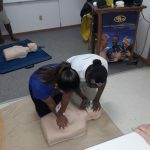 The Employee CPR training at AKR was a great accomplishment! We thank Ronald Ellerman for the time he devoted to the training of our staff. His experience and expertize in the field are priceless! 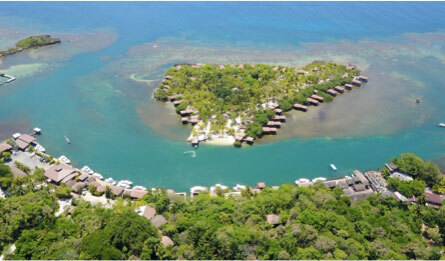 As our guests, we are committed to your safety and our excellent safety record reflects this commitment. 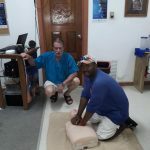 Now, in addition to the clinic and hyperbaric chamber, many of our staff are now trained in CPR and can assist in a time of need.